Show your patriotism, spread your message and help clients take the stress out of their daily routines! 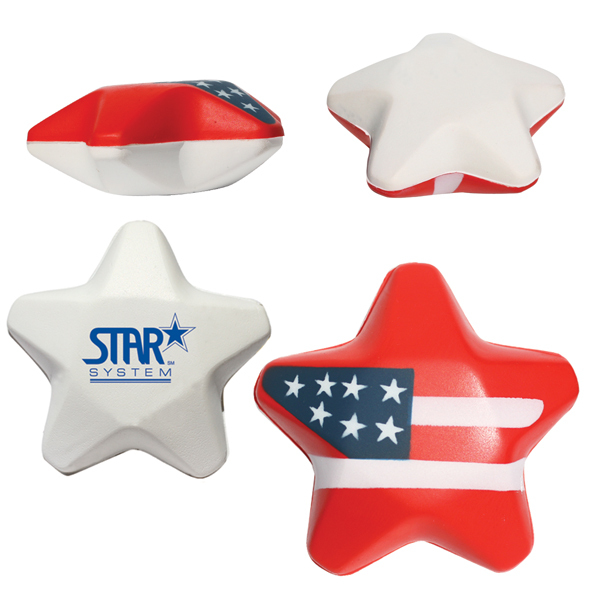 Made of polyurethane, these star-shaped flag stress relievers are manufactured by hand and individually hand printed. Placement of second imprint may not be centered. Factory is not responsible if imprint is not fully legible. Imprint will break and appear uneven due to the textured surface. Not intended as a toy for pets or small children. 3 1/4"w x 3 1/4"h x 1 13/16"
Bulk / 31 lbs / 350 pcs. / 14.00" x 18.00" x 14"box.